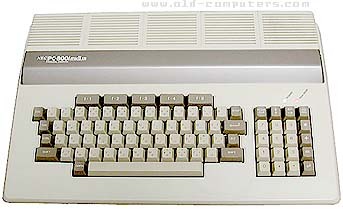 The PC-8001 MKII SR was the last one of PC-8001 Series. In 1985, PC-8801 series took the place of the PC-8001 series along with a large amount of available software, so this computer didn't meet a large success. This machine displayed not only Katakana but also Hiragana characters, a Kanji-ROM was available as optional extra. Thanks to Yoshiki Yasui from Japan for information and pictures. TEXT MODES 80 columns x 25 lines (8 colours) max. GRAPHIC MODES 640 x 200 dots (8 colours) max. see more NEC PC 8001 MK 2 SR Ebay auctions !